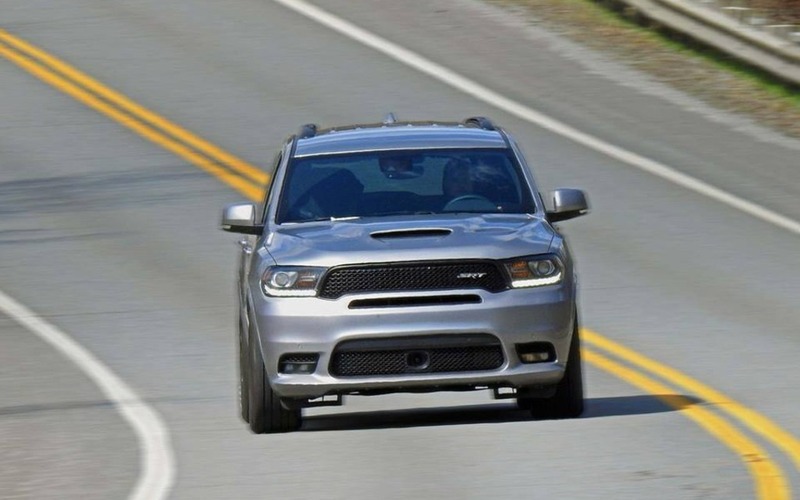 When Dodge was fine-tuning the 2018 Durango SRT around Virginia International Raceway, it tested the rig with and without an air intake fitted in the lower left corner of its front fascia. Realizing it was quicker this way around the track by 1.2 seconds, the SRT geeks decided to leave the intake there. Obviously, such a decision hinders the Durango’s off-road abilities. But that’s ok, because this isn’t just a Durango. It’s rip-snorting, V8-powered brute borrowing its reflexes from an NFL pro linebacker. It just so happens to seat six while delivering your Costco order back home. Everything about the Durango SRT is big, and a lot of it appears useless on paper. Until you drive it. I’m the first that loves the idea of an SUV that can launch out of the hole in under five seconds. This one gets the job done in 4.7. It’s fast, but it’s also not all that complicated. 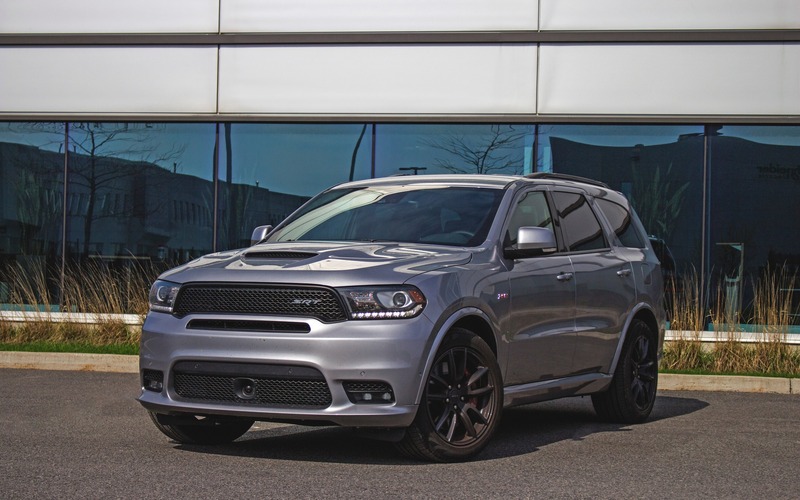 Selling for a starting price of $71 345, the SRT sits at the top of the Durango lineup and picks up where the R/T stops. The 5.7-litre HEMI V8 is swapped for the almighty naturally aspirated 6.4-litre V8, the same engine found in the Challenger T/A and Charger Daytona. Dodge then modifies the truck’s suspension with adaptive Bilstein shock absorbers and stiffer springs. The rear anti-roll bar is also 18 percent stiffer. 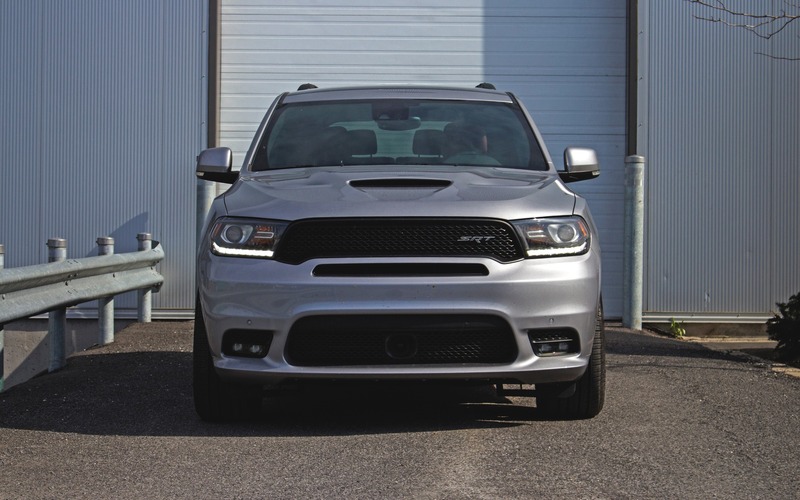 The SRT folks then apply the full badass treatment with a wide-mouth grille, dual exhaust outlets, as well as a properly aggressive hood scoop with heat-shedding, rear-facing nostrils. In this form, power is claimed at a muscle-car appropriate 475 horsepower and 470 lb.-ft. of torque. The only available transmission is an eight-speed ZF-sourced automatic. All-wheel drive comes standard, so does launch control and a throaty exhaust note. 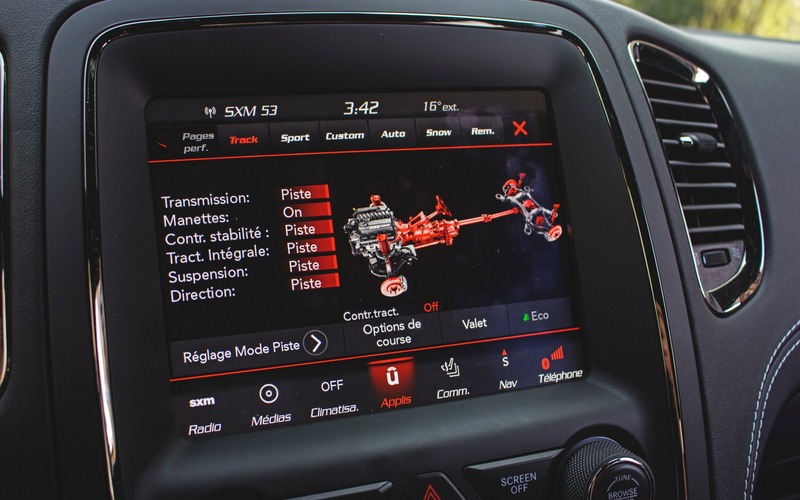 Set the Durango SRT in Track mode from its Performance Pages menu, easily accessible through FCA’s simple and frankly, quite brilliant, Uconnect infotainment system, hold the brake, mash the throttle, release the brakes, and the 5369-pound (2435-kg) family hauler launches hard and shoves you in the seat, with ample traction from that all-wheel drive system, and occasional exhaust farts spurting out of its dual tailpipes. Saying this thing is fast is an understatement. Of course it’s quick, but it’s how savage its performance is that truly impresses for a vehicle of this size and weight. The eight-speed automatic does a great job of putting the power down, if not a bit crude around the edges. It isn’t the smoothest system, but rather an effective one. It rams gears in without apology and occasional clunks can be felt upon downshifts. The paddle shifters work great at extracting all the power, though. In Track mode, the Durango SRT’s suspension is rock hard, bouncing and jittering over the slightest of road imperfections, its steering wheel heavy and its enormous Brembo brakes always ready to bite hard. In many ways, this feels like a very big all-wheel-drive hot hatch, almost like a Ford Focus RS. But with a V8. The SRT is actually nimble around corners and stiff. Turn in is sharp, body roll is surprisingly subdued and while it’s no sports car, it can hold its own in the twisties with some of the best ones out there. That all being said, be careful when commanding those Brembos to slow you down at high speeds, because the Durango’s chassis can easily be unsettled. After all, this was first intended to be a three-row SUV. And it’s a heavy one. Don’t forget that. That’s also one of its best aces up its sleeve. As a daily driver, when set to Auto mode, with the Eco function activated (yes, this thing actually has an Eco mode), the Durango SRT’s suspension suddenly becomes soft, compliant and smooth. The gearbox quickly upshifts to a higher gear for optimal fuel economy, the V8’s rumble is pleasant even at low speeds and thanks to cylinder deactivation, we were able to record a 13.8 L/100 km fuel consumption average. That’s better than a Nissan Armada and a Toyota Sequoia, but none of these trucks is as fast as a Subaru WRX STI. The darn thing will even tow 8700 lb (3946 kg) with the proper equipment. 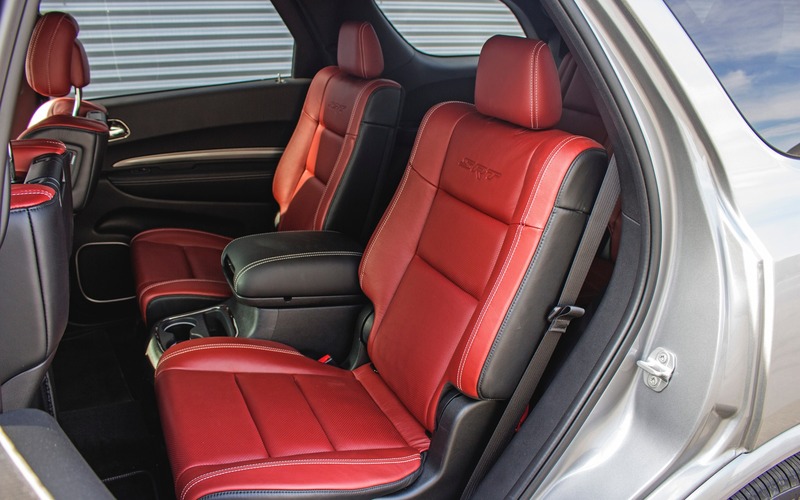 With the seventh seat removed, the Durango SRT obviously loses a bit of utility, but the set of sporty red captain bucket chairs that were put there instead not only look absolutely stunning, but envelop occupants in fine Nappa leather similar to what you’d find in a Dodge Viper. The Durango’s third-row seat remains a tight fit, especially when you’re a tall adult. It’s mostly good for the kids. But once the entire stack of benches is lowered flat, Dodge’s big guy boasts one of the largest cargo holds in the segment with 2406 litres of available space. Like much of FCA’s current lineup, the 2018 Dodge Durango is without question a very likeable brute, one that can hustle like a genuine athlete even with a lot going against it like weight and size. But while that HEMI does everything it can to be thrifty, it’s still a 6.4-litre V8. With gas prices suddenly spiking, trotting around town in a high-performance Mopar SUV that recommends premium fuel can get a little annoying. If you can afford the gas bills, it is an endearing, unique, if not ridiculous thing, one that will soon be phased out. Hey, you only live once; you might as well enjoy this American badass while you still can. 5/10	Although the Durango SRT is powered by a high-performance V8, its 13.8 L/100 fuel consumption average is still thriftier than some Japanese V8 SUVs. 8/10	Those enormous sport leather seats wrap around you like a warm blanket, and the same can be said for the ones out back. But that third-row seat is best suited for kids. 9/10	Strong acceleration, V8 torque, impressive handling, face-ripping brakes. 9/10	Uconnect continues to impress by its straightforward touch-operated interface, intuitive redundant physical controls and Performance Pages for setting up your speed machine. Android Auto/Apple CarPlay compatible. 8/10	There's a lot to like here. The Durango SRT is fast, sounds great and is surprisingly nimble for its size and weight. 8/10	Although unrefined and unfriendly to the planet, the Durango SRT is fast, loud and unique. It's a lovable brute that still manages to excel at family hauling duties.